Scroll down for instructions on installing carbon fenders. 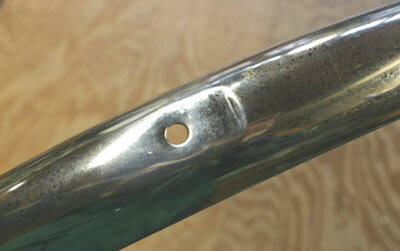 Berthoud stainless steel fenders arrive with only one hole drilled. It's for the mounting point at the fork crown. There's a hole and the fender is indented slightly for a better fit under the fork crown. Other than that one hole, the fenders have no provision for mounting, when you receive them. You will get hardware, so don't worry. 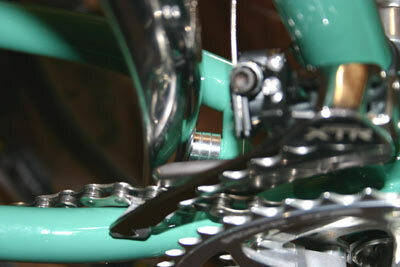 But unlike other fenders such as SKS, none of the hardware is pre-attached to the fenders. So these take a little work to install on your bike. If you're not handy with a power drill, you'll want to either take these to your local bike shop for installation, or consider another brand of fenders. And, the Berthoud fork crown hardware is designed exclusively for forks with a steerer tube having an outside diameter of one inch, which was the almost universal standard for bicycle forks until the mid 1990s. It won't work on fork with 1 1/8" steerer tubes, which are becoming increasingly common these days. You'll have to make your own hardware if you have a steerer larger than 1" outside diameter. Here is a fender strut, across the end of a fender. The struts come with holes drilled in them already. You have to drill holes in the correct locations on the fenders. Use the holes in the struts as your guide. Decide how close to the back end of the fender you want to position the strut. Keep in mind what else you may want to put on the fender. A rear fender is a nice place to attach a light. But the position of fender mounted tailights determines where the brightest parts of the light's beam is aimed, so you don't want the location of the light to be right where you have placed the strut. Here's the rear of the front fender, viewed from the underside. I've installed a mud flap. The fender struts are high enough to leave room for mounting the mud flap. Even if you don't get the mud flap, I'd suggest mounting the strut high enough so that if you decide to get the mud flap later, you'll still have room. 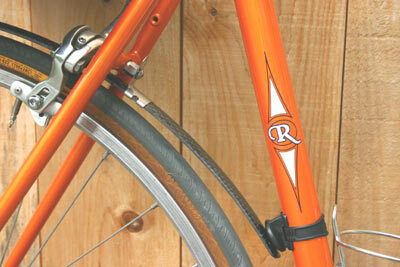 On some frames, the chainstay bridge may be further away from the fender than you would like. Put spacers between the fender and the bridge to take up the gap. Also, it's easiest to mount these fenders if your chainstay and seat stay bridges have threaded holes facing the fender. If your bike doesn't have threaded holes in the bridges, you'll want to use ZIP ties to hold the fenders on. These work quite well. You'll need to drill a few holes of course. And be sure to smooth any rough edges on the holes after you drill them, otherwise the edges will cut through the ZIP ties. Here's the fork crown with the fender mounted. You can see the rubber grommet and the stainless steel washer. You can also see the back end of a bolt through the fork crown. That isn't included with the fender. But a very interesting bolt is included. It has a hole in it for the bolt that goes front to back through the crown to go through. See the picture below. The bolt has a hole in it. The hole is for another bolt that goes through the fork crown, front to back. The other bolt goes through the front of the fork crown, then through the hole in the bolt pictured here, and then through the back of the fork crown. The threaded end of the bolt pictured here hangs down from the center of the fork crown and goes through the washer first, then the rubber grommet, then the fender, and everything is held together with a nut. 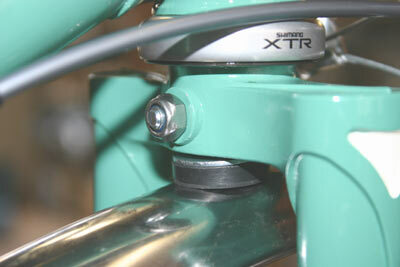 Here the struts attach to the dropouts. The struts may be longer than they need to be. They are aluminum, and it's easy to cut them to length. I used SIS housing cutters. It's easy. It's hard to see here, but I've hung the fender from the rear rack using a ZIP tie. That makes it easy to see how everything lines up when you've only got two hands. For those of you with three or more hands, you can skip the ZIP tie. 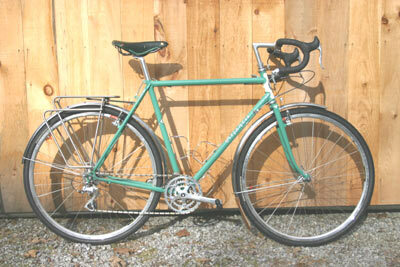 Rivendell Atlantis with Tubus Cosmo rear rack and Berthoud stainless fenders installed. Parts for Berthoud stainless steel fenders are available. I stock the aluminum struts, all the nuts and bolts, as well as the fenders themselves without hardware. So if anything should be damaged in a crash, you can buy what you need to make repairs. See the Berthoud Parts page. If your fork does not have eyelets at the dropouts, or if it looks significantly different than the Atlantis fork pictured here, such as those bizarre one legged "forks" that Cannondale makes or some other such goofy thing that's TEN GRAMS LIGHTER!! !, I cannot offer you any advice regarding how to mount these fenders on your bike. Bikes that are designed to work with fenders are not that hard to find these days. My best advice is to purchase a bike designed to work with fenders. You may, however, upon seeing these photographs and descriptions of how to mount these fenders on a fork designed for them, be able to see a possible way of mounting them on your bike. If so, great, we'll sell you the fenders. 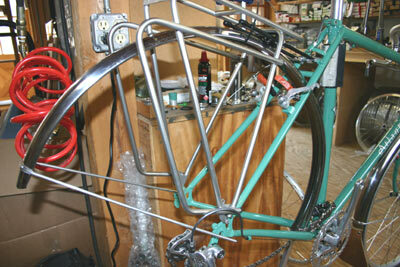 But we cannot and will not advise you on how to go about modifying either the fork or these fenders to make them fit. You're on your own. Please do not call us or email us saying that you have such and such bicycle with a certain fork, etc. and want to know if we think these fenders will fit. I don't know if they'll fit, or can be attached securely, and since I don't have your fork or bicycle here to look at, I can't possibly know. You really really really really really really really really really really are on your own. Sorry. Back to the Berthoud main page. The Berthoud Carbon fenders are narrow at 25mm, and very lightweight. 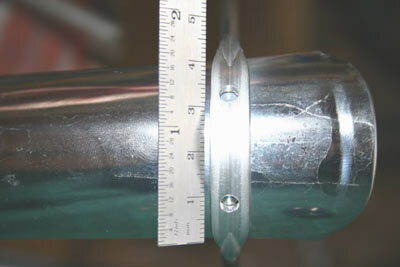 The mounting hardware is a bit different than what comes with the stainless fenders.The connections between the struts and the fenders are the same, except that only one bolt is used at each connection, rather than two. Also, the struts attach to the frame in exactly the same way, using identical hardware. The carbon fenders come pre-drilled, so all you have to do is shorten the aluminum struts if necessary, and bolt them on. 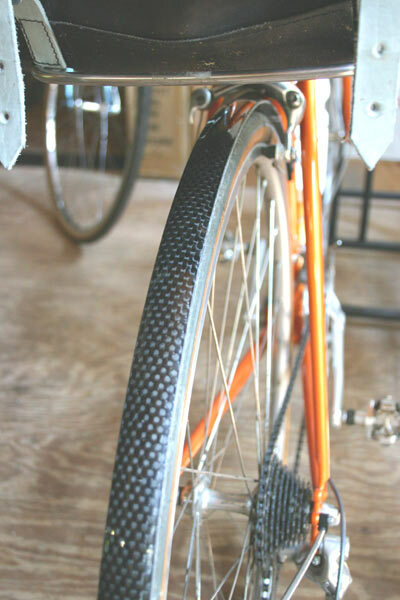 Modern racing bikes come with brakes that attach with allen nuts. These can make mounting fenders a bit awkward. But Berthoud provides special nuts which replace the allen nuts allowing you to mount the fender directly to the end of the nut. 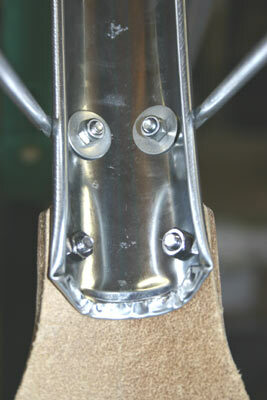 Here's a picture showing the back side of a fork crown designed for an allen bolt sidepull brake. This is the nut that replaces your allen nut. 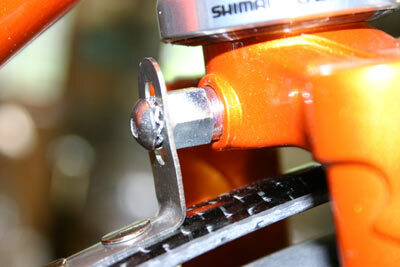 It functions exactly the same as the standard allen nut as far as keeping your brake attached securely to your frame. It tightens with a 10mm box end wrench. You can see that it's threaded at the outer end. That's to take another bolt, which will hold on the fender mounting bracket. See? 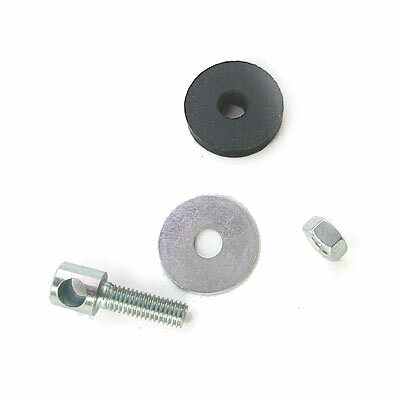 The round head allen screw bolts into the special replacement nut for your brakes. It's an ingeneous solution to the problem of mounting fenders to bikes with allen nutted brakes. And it allows you to remove the fenders without loosening the attachment of your brakes. These special allen nuts are included when you buy the fenders. And, yes, I have these available separately, and in four different lengths. The dimensions, 9mm through 30mm, are for the part of the nut that you can't see, the part inside the fork crown. Different lengths are needed for different fork crowns, and for different applications. 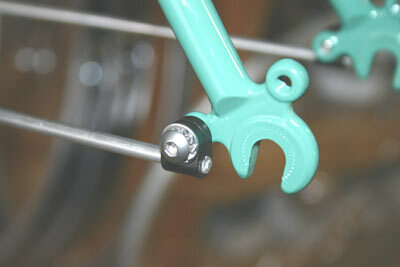 For example, if you are mounting not only fenders, but also a Busch & Müller Ixon headlight to the fork crown, that Ixon mount is 10mm thick, and so your caliper brake will then be another 10mm further forward of the fork crown, and the rear nut will have to be another 10mm in length, over and above whatever length it needed to be without the Ixon mount. 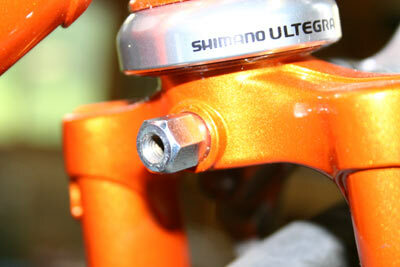 You can use these special nuts at the fork crown, and at the seat stay bridge as well. Here's the forward mounting point of the rear fender. There's a little screw and washer holding the end of the fender on this little nylon clamp. At the brake bridge, there's a conventional fender mount attached to the same special brake nut used in front and pictured above. 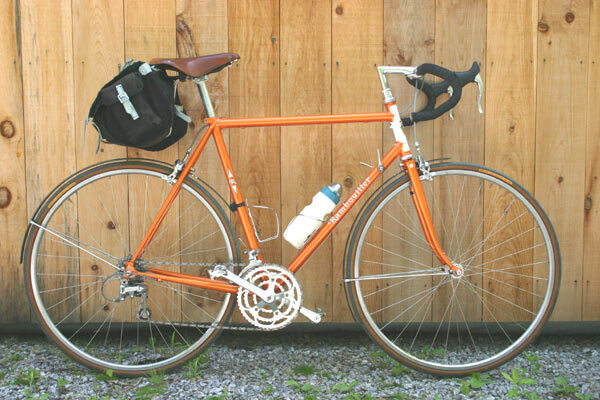 Here's my Rivendell Rambouillet with the Berthoud carbon fenders mounted. These are truly minimalist fenders, just wide enough to keep most of the water off you from below, but clearly not giving you as much protection as a full coverage fender, such as the Berthoud stainless steel fenders. I expect my feet will get a good deal soggier with these. But they sure are light. The tires are Continental Ultra 300 700x28mm, which measure about 25mm wide. Now if only it would rain! Go to the Berthoud Parts page.